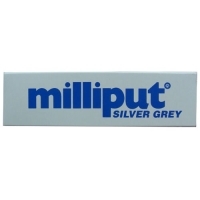 Milliput is an epoxy putty. 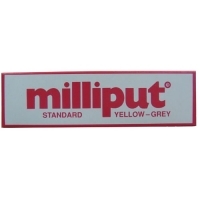 Milliput produce five grades: Standard Yellow/Grey, Silver Grey, Superfine White, Terracotta, and the latest addition - Milliput Black. 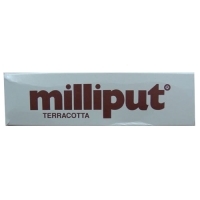 Each grade is presented in similar packs containing 2 x 56·7gm. sticks and the general instructions for preparation and usage are the same. 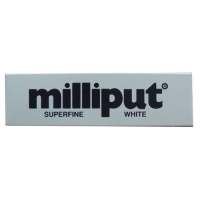 The two sticks have a long shelf life but once mixed the resultant putty is at first soft and highly adhesive and then gradually hardens. 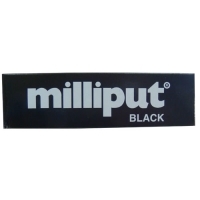 Speed of hardening is dependant on temperature and at normal temperatures (20-25ºC) Milliput becomes rock hard in three to four hours. By the application of heat the setting time can be reduced to a few minutes.